In today's dynamic business world, where businesses are focused on realizing value amidst the classic constraints of utility, warranty & costs, it is becoming increasingly important for projects to be managed professionally thereby delivering the expected benefits. This has led to a trend of using the best practices and standards in project management while executing projects thereby remain competitive and valued. The Project Management Institute (PMI)® standards around project management, program management as well as portfolio management have been widely recognized and used across industries and domains to deliver expected business value. The Project Management Professional (PMP)® program is designed to lead the participant to an internationally recognized certification from the Project Management Institute (PMI)® - USA. This program prepares you to take either the Certified Associate in Project Management (CAPM)® or the Project Management Professional (PMP)®. The difference between the eligibility for these qualifications is the total experience a personnel has in the project management field. If you have a high school Diploma or equivalent and 15 hours of contact time around formal project management training then you are eligible for the CAPM®. If you have at least 3 years experience in managing or directing project activities as well as 35 contact hours of PM education and a Bachelor’s Degree or equivalent then you are eligible for the PMP certification examination. This course is designed for project managers, project team members, other managers and all those who would benefit from exposure to best practice in project management. The PMI is the predominant project management standard outside of the UK and Europe. 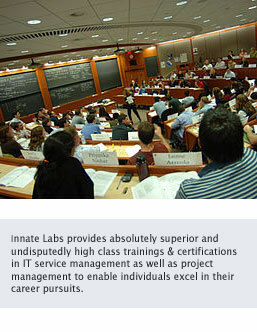 Innate Labs is a Global Registered Education Provider (R.E.P.) officially approved by PMI - USA. (REP ID : 4260). Innate Labs has been a preferred knowledge service provider to leading MNCs and corporates across india and has been consistently adding value to these organizations through value based qualification certifications including ITIL, PRINCE2, PMP, SixSigma. We believe doing a certification is an important well-thought decision of our delegates. We would not only enable our delegates to achieve success in certification exams but also equip them with the right skills and knowledge to take the professional challenges heads on. We believe that clearing a certification exam can give you a certificate which is nothing but a piece of paper if you do not have the right knowledge to prove your credentials. Certification without knowledge can lend someone to an interview call but cannot help someone get a job or grow in their career path. Knowledge is the core and certification is just a proof of your knowledge. Hence, our trainings are knowledge-driven rather than just certification-driven, and, the end result of our training is a 100% success in the certification exam as well as increased confidence of our delegates to leverage their career with the knowledge shared. Our trainers are proficient and seasoned project management practitioners who are PMP certified in good standing and are accredited for conducting the training and certification workshops. The trainers have on an average 15+ years of practical experience working in all project management phases and have played several roles in the project/program as well as portfolio management role ladder. It is this experience that enables our delegates to gain the right practical knowledge coupled with the best practice standards helping them to achieve their career aspirations in our 4-day training and certification preparatory sessions. The class sizes are limited. Enroll now to experience the quality and expertise of Innate Labs. The PMP training and certification preparatory course includes work-based practical activities and discussions as well as sample questions.